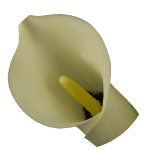 Calla Lilies (Zantedeschia) come in a wide array of colors, such as various shades of white, cream, green, pink, purple, peach, yellow and orange. Callas are one of the most beautiful flowers with a unique flower form. This elegant product can be used in wedding bouquets as well as in centerpieces. Re-cut stems upon arrival place in room temperature water for storage, Callas do not have to be kept in really cold temperatures like most other cut flowers. Generally, 40-60 degrees temperatures are fine, as Callas last a long time when cared for properly. Callas should be put in only 1” to 1.5” of water, as they perform best in low levels of water. Too much water will cause the stems to turn soft. Callas perform better in straight water versus floral foam. When Callas arrive slightly dehydrated wrap in paper re-cut stems and let hydrate for a couple of hours.